Ah yes, the Auston Matthews, Patrik Laine draft. Who could forget what happened after their names were called first and second in 2016? I never will. The Columbus Blue Jackets won one of the lottery draws in that offseason. Their reward was picking third overall. They won the right to select “can’t miss” Finnish prospect Jesse Puljujarvi. You remember the build up to that draft, right? Puljujarvi was the consensus third-overall pick that season. No matter which media outlet or publication you turned to, Matthews, Laine, Puljujarvi was the top-three. It made everyone think the real fun would start with the fourth pick and the Edmonton Oilers. But the Columbus Blue Jackets had other ideas. When it was their turn to pick, they shocked the hockey world. They did not select Puljujarvi. They selected Pierre-Luc Dubois. The collective reactions heard within the walls of Buffalo’s First Niagara Center (now KeyBank Center) said everything you needed to know. Whether it was shock, disbelief, or some other extreme reaction, you could see it all. 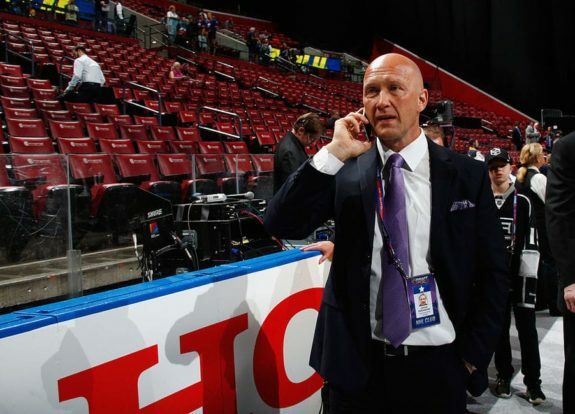 But yet the image of the night that still resonates with me to this day was the look that Blue Jackets GM Jarmo Kekalainen had after Ville Siren announced the pick. He knew he shocked everyone. He wore a smile on stage. He knew something everyone else didn’t. That’s where this story begins. I was wrong. As writers, we can never be right about everything, but we certainly try. Admitting you’re wrong or you failed at something is an extremely hard thing to do because it’s a personal attack on your pride. One tries to justify something but it usually ends up in excuses. Let me set the scene for you. I was one of many on the pro-Puljujarvi train. I watched a bunch of film. I spoke to him at the Combine. I walked away impressed. In my mind, I was sold on the Blue Jackets taking him. The big stage didn’t seem overwhelming to him. The skill and upside he had wasn’t quite to Laine’s level but it was really good. I looked at other players that maybe could have went third. I saw Dubois and Matthew Tkachuk. I spoke to both of them at the Combine also. I still left there more impressed with Puljujarvi. I thought he was an eventual superstar. If they were going to pass on him, a trade had to happen. In addition, I was skeptical of Dubois’ ranking jumping up from seven to two on the final rankings in such a short span. And Tkachuk seemed to belong in the tier behind Puljujarvi. You take the best available player regardless of position always, always, always. Not only did this pick blow my mind, the fact there was no trade blew my mind. I thought Dubois was a decent player but not a number-three overall type player. He even went back to juniors and struggled at first. Alarm bells were going off most of that following season. Here’s the part where I put my pride and all else on the shelf. I was 100% wrong about this whole situation. It turned out everything I thought I knew I didn’t know at all. I will eat crow for this from now until the end of time. The Blue Jackets got this right. Imagine where’d they be had they listened to the consensus “experts.” They’re likely still looking for a top center and they would have passed on their best available player. Turns out they took the best available player. Very few at the time knew that though. Dubois did start out slowly. He was sent back to juniors the first season. He struggled out of the gate but turned it on in a big way after being traded to the Armada. He led them to a deep playoff run. In year two, Dubois came to Columbus much more prepared to tackle the difficulty of a John Tortorella training camp. He made the team but started in the bottom-six. With some of the other centers struggling, Dubois got his chance to play top center. From that point on, he has not looked back. He finished the 2017-18 season with 20 goals and 48 points. He played against the competition’s best every night. We all started to see why the Blue Jackets took him where they did. If he could play like this as a 19-year old, what’s his upside? Flash forward to this season. Dubois is an almost point a game player. He has 14-18-32 in 37 games and is getting better everyday. Want to see an example of what he brings to the table? Watch his overtime winner from Thursday at Madison Square Garden. We knew Dubois was strong. He can hang in there with the toughest of customers. But this overtime goal shows us what he is capable of doing. First the decision to accelerate down the wing after Artemi Panarin hit him with the pass. Some may have been content with protecting the puck or carrying it slowly into the offensive zone. Dubois turned on the jets at the right time. That was a smart move. He’s a really smart player. Next that speed! Did you see him blow by Kevin Hayes? That was just over 30 seconds into overtime. That’s scary speed for someone as big and as physical as he is. And he’s not done growing and filling out. Finally was the shot itself. Henrik Lundqvist is a future hall of famer. You need perfect shots to beat him most nights. Dubois pulled that out of his arsenal as well and showed his ability to score the puck. It was his first goal in 11 games but it was a beauty. So in summary, Dubois can skate, score and play physical. He’s only going to get better. He is showing us consistently why the Blue Jackets stuck to their guns and took him without trading out of the third spot. Dubois: 32-48-80, +16 in 119 games. Puljujarvi: 16-17-33, -3 in 119 games. Many experts were wrong. I was wrong. Dubois is the real deal. The lesson learned? Don’t be so rushed to judgment in these things. Keep an open mind and let things play out. You’ll be glad you did.